SB scenery sandwiching older shields. 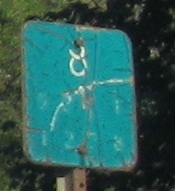 NB old signs in the same area. 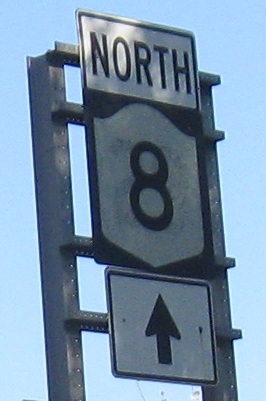 The NY 8 shield, atop some ordinary NY 7's at that junction, appears to be a reused NY 28. More SB photos through the next set of bucolic farmland. 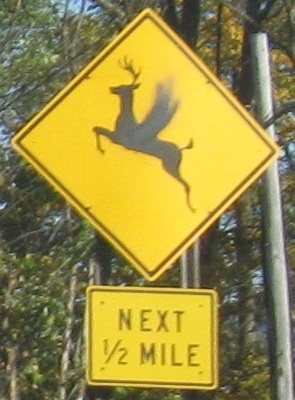 Continuing north from NY 7, I have to watch out for either Santa's reindeer or some really awesome antlered, legged eagles. 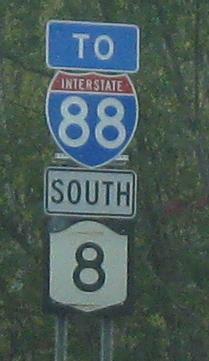 Then there's the 19th-century turnpike milepost at the beginning of NY 51, which ought to extend to the left just because of this sign. 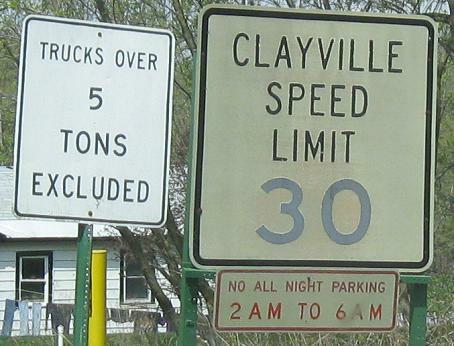 They don't make signs like this anymore, and I'm not sure there are any left in the state. 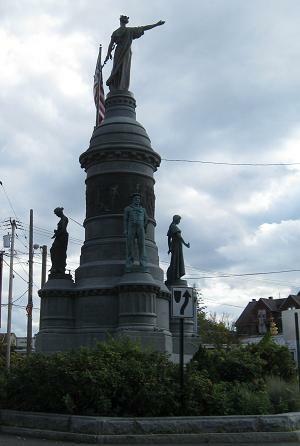 There was at least this one in New Berlin when Michael Summa found it in 1976. 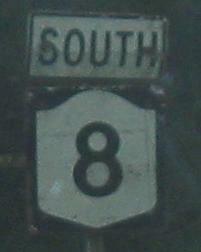 All SB; the first photo is at US 20. One unwitting farm finds itself the subject of scenic beauty on my site. 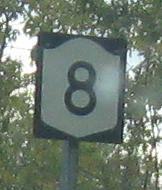 The treasures of old NY 8 in Utica. 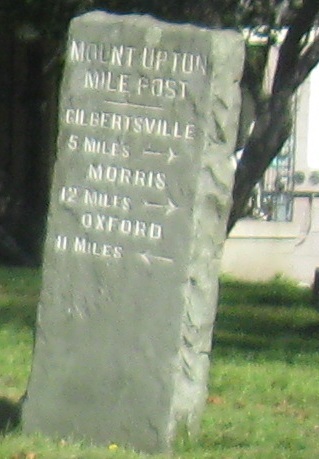 State St. at Genesee St. in downtown, then Oxford Rd. 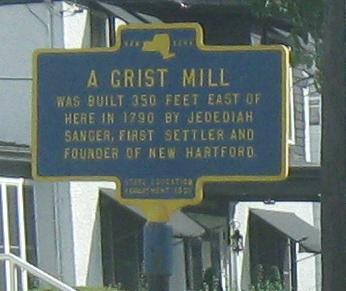 at Mill St. in New Hartford. 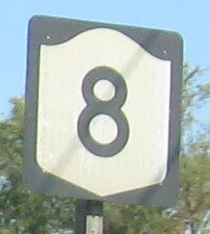 NY 8 followed Genesee through Utica and left old NY 12 onto Oxford Rd. 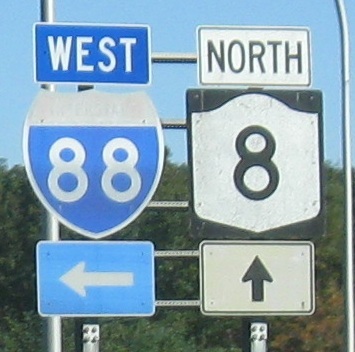 BGS's on NY 8 NB approaching the NY 5/12 duplex, courtesy Doug Kerr. 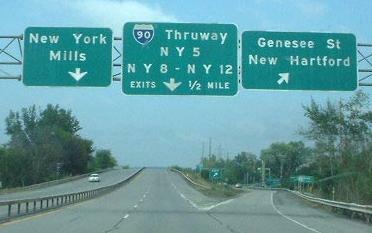 The I-90 interchange is actually located at Genesee St., but it's a lot quicker to go through Utica on the 5-8-12 expressway. 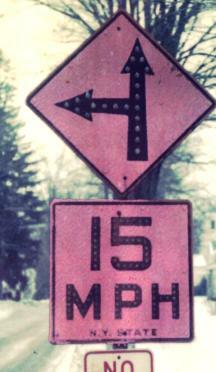 At the time these photos were taken, straight ahead was New Hartford St. into downtown New York Mills. 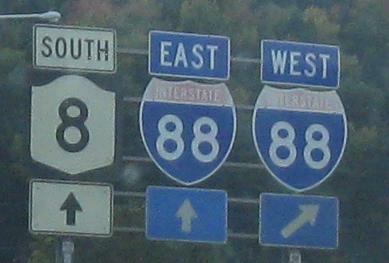 All of the signs at this interchange have been replaced because since then, NY 840 (Judd Rd.) 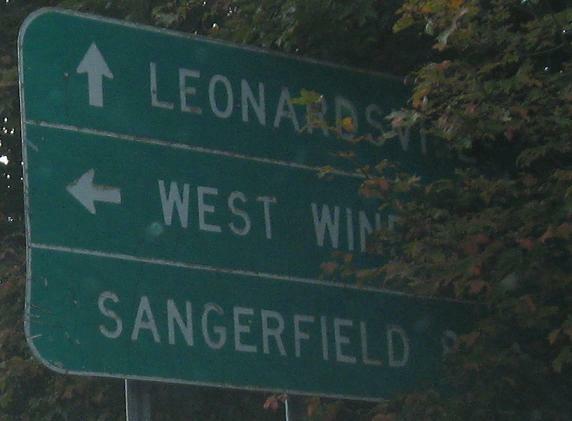 was completed to the northwest and took over the northwestern leg of this interchange. 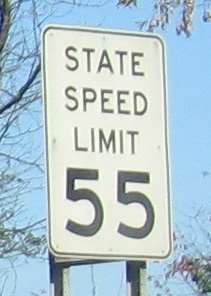 New Hartford St. is now just a local road, and traffic uses NY 5A to get into town. 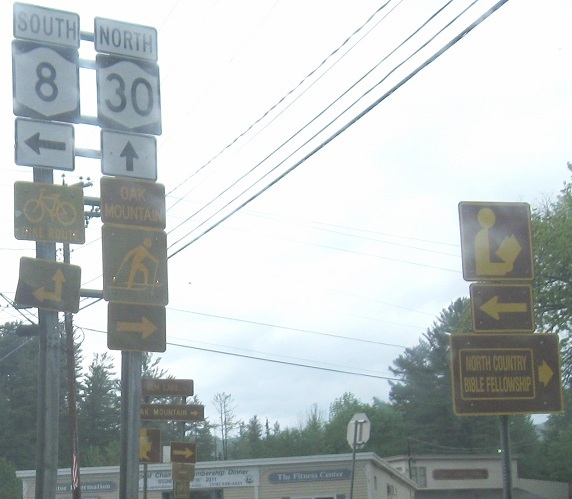 Adirondack-standard gold and brown signage on a wrong-way concurrency.